Lit professor and gambler Jim Bennett’s debt causes him to borrow money from his mother and a loan shark. Further complicating his situation is his relationship with one of his students. Will Bennett risk his life for a second chance? A remake of the 1974 film of the same name (starring James Caan), ‘The Gambler’ is a mediocre film about a college professor with an all or nothing attitude to life, that frustrates because the elements are here to make a classy, stylish thriller akin to those made in the 1970’s. Jim Bennett is a college professor with a gambling addiction, who is given 7 days to pay back several dangerous loan sharks or face the consequences. In order to reach his target, he needs to borrow money from others, persuade a student to rig a sports match, and face some good fortune at the casino. This should be exhilarating to watch, but it isn’t, and I’ll try to outline the reasons why. The problems begin with the casting, namely Mark Wahlberg in the leading role. For the character of Jim Bennett, the script requires an actor that can suitably portray the two sides to him, the college professor by day, the gambling addict by night. Playing the second part is no challenge at all to Wahlberg, and he excels in the scenes dealing with a variety of loan sharks and those in the casino, but he just isn’t suitable to play the college professor. To buy the film’s premise, we need to believe in both sides of Jim Bennett’s character and unfortunately Wahlberg is found lacking through half of his scenes. It doesn’t help that his character is particularly difficult to root for, coming across as if he has a death wish with no real reason given for why he is so self destructive. Compare this film, and this character, to Nicolas Cage’s Oscar winning performance in ‘Leaving Las Vegas’, a comparatively powerful performance of a man who feels he has nothing left to live for, and you can see where ‘The Gambler’ could have made improvements. This brings us on to the second issue with the film, and it’s William Monahan’s script. Monahan was responsible for the script to the terrific ‘The Departed’ (which was a remake too), also starring Wahlberg in one of his finest roles, but in this case there is too much effort put into stylising the dialogue for what is a fairly standard premise and plot. Characters spend a lot of the time talking in riddles, with the writing too focused on sounding clever than in sounding real. John Goodman is always an entertaining presence on screen, and his loan shark just about manages to sell some of the ridiculous writing he’s asked to pass off as advice, but it does really take you out of the moment. The rest of the support range from excellent to miscast, with Jessica Lange and Michael Kenneth Williams faring the strongest. Lange can play the icy matriarch in her sleep, and she injects every scene and every line with an appropriate level of venom. Unlike many of the other characters in the film, her motivation’s may be misguided by her love for her son, but they are clear and make sense in the wider context. The other leading role is filled by the talented young actress, Brie Larsen (particularly good in ‘Short Term 12’), as one of Bennett’s students and his primary love interest. Larsen isn’t given much to work with here and it’s difficult to buy her motivation in going for Bennett – he comes across as arrogant and reserved with very little charisma, so she ends up feeling more of a plot point than a fully developed character. Despite this review sounding particularly negative, I did enjoy the film overall and my disappointment stems more from the missed opportunities than anything else. Wyatt’s direction is pretty good, and he uses some strong editing in the gambling scenes to ramp up the stake, although ultimately to care about the outcome of each spin we need to be fully invested in Bennett’s situation and we’re not. The film has a great soundtrack (M83, Rodriguez etc) and some stylish bursts, but they aren’t frequent enough. 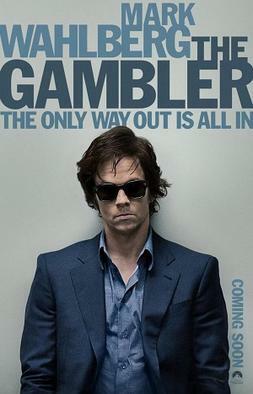 Ultimately, the problem with ‘The Gambler’ is that I just don’t buy a lot of the developments, from the casting to the writing, and it makes it difficult to invest in.